Enjoy Great Desserts and Support CCSEM! 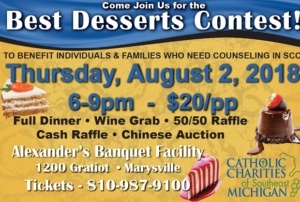 Enjoy some of the best desserts in town at the annual Catholic Charities Best Desserts Contest. The event takes place Thursday, August 2, from 6:00 to 9:00 pm at Alexanders Banquet Facility, 1200 Gratiot, Marysville. Tickets cost $20 and include a full dinner, wine grab, Chinese Auction, and a 50/50 and cash raffle. All proceeds benefit the individuals and families served in the CCSEM Behavioral Health counseling services in St. Clair County. For tickets, call 810-987-9100.